Mods idk if this should be in the korean section since i put asian not just korean???? We like the same things lol, specially movie taste. 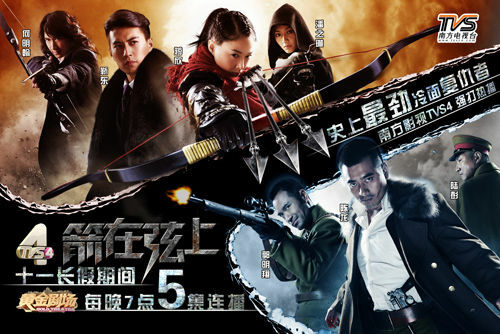 I just finished watching Arrows on the bowstring ... it's a drama in china ... very very good!!! My mom put it on and I was just watching it over her shoulders ... next thing I knew, I was sucked into the dialogue. I think viki has it subbed if you're interested in watching on line. The story is about three siblings who are skilled archers. Their whole family got murdered on the wedding day of the oldest sister so the jist of the story is them avenging their family. BTW the main guy is hooooot!!! Have we met cause I think we should meet. You like the same movies as me and that has not happened before. I would not recommend Sympathy for Lady Vengeance though. It wasn't that great. PS. Have you watched the Crucible aka Silenced? I do recommend it. Bring tissues. ps. I swear to heavens, Cha Seung Won gets really good movies with amazing casts. On that note, I need to finish the last minutes of some of these movies. Hmm, I liked Lady Vengeance. Maybe I'm just biased in my love for the non stereotypical female characters in most Korean movies. The other 2 movies in the Vengeance trilogy do pale in comparison to Oldboy though. Neither of them are incredibly outstanding, but still good nonetheless I'd put Lady V over Mr. V tbh. The Crucible is on my list of movies to watch, I haven't gotten around to it yet. Do you have any other suggestions? I'm pretty new, for the most part, to Korean Cinema. I'm also trying out Chinese moves. I started Infernal Affairs, but I haven't finished it yet.